Place of Birth: Ehrenfeld, Pennsylvania, U.S.
Charles Bronson was an American actor, also credited as under his birth name, Charles Buchinsky. He was legendary for playing tough guy roles. Charles’s father, Walter Buchinski, was an Eastern European emigrant, evidently from Druskininkai (now in Lithuania). Charles’s mother, Mary (Valinski/Valinsky), was born in Pennsylvania, to Eastern European parents. Charles’ maternal grandmother was named Mary A. Butsavage. In Ehrenfeld, we were all jammed together. All the fathers were foreign-born. Welsh, Irish, Polish, Sicilian. I was Lithuanian and Russian. We were so jammed together we picked up each other’s accents. And we spoke some broken English. When I got into the service, people used to think I was from a foreign country. People in this country think I’m an Indian, but I’m Slavic. I don’t care where I came from-it doesn’t matter. But I’d like to go to Lithuania some day, just to see it. And Russia, see what it’s like…. Charles’ parents’ surnames were not particularly Lithuanian, although it is possible that they were changed from more Lithuanian-sounding names. It appears that the family spoke Lithuanian. It was uncommon for working-class Eastern European Catholic immigrants of the time to have ethnic Russian ancestry, so it is not clear if Charles’ statement that he had Russian ancestry was accurate. Some internet sources state that Charles had Tatar ancestry on his father’s side. It is not clear what the source of this claim is, or whether Charles himself stated so. Charles’s father, mother, and Charles himself, are listed as “White” on the 1920 U.S. Census, and Charles’s paternal and maternal grandparents are all listed as having been born in Lithuania. Charles was married to Kim Weeks, until his death. He had two children with his former wife, Harriet Tendler, and two children with his former wife, English actress and singer Jill Ireland. Charles is listed as having been Jewish on several web sites. He was not Jewish. However, his first wife Harriett is Jewish. Why is Polish in his ethnicity? His father identified as born in Lithuania, and his mother as born to Lithuanian parents on the census. Yes, “Bunchinski” is not very Lithuanian name, but “Bunchinski” was anglicized to “Buchinsky”, and might already have been an anglicisation, given that the latter was not at all a significant change. If it is not, it could be Russian/Belarusian/Ukrainian too, variants of the surname tend to be more prevalent in any of those than in Poland. As for his mother’s surname, “Valinskis” is a Lithuanian surname, and variants of “Valinski” is most often Russian/Belarusian/Ukrainian rather than Polish. His Lithuanian name was “Karolis Dionyzas Bučinskis”, according to geni.com, Lithuanian Wikipedia, and a bunch of other articles, sites etc. He also grew up speaking Lithuanian and Russian, and only learned to speak fluent English after serving in the military. Charles’ father, Walter P. Buchinsky (Bunchinski, Bučinskis), was born in Druskininkai, Lithuania. Charles’ maternal grandparents were ? Valinsky/Valinski and Mary A. Butsavage. In conclusion, there is little reason to suppose that Charles Bronson was of Polish descent. His parents identified as having Lithuanian parents on the census, Charles spoke Lithuanian growing up, and he has said himself that he is of Lithuanian and Russian descent. If he has any non-Lithuanian ancestry it is more likely Russian, Polish seems farfetched. When it comes to Central European and Eastern European ancestry, census records’ listings of country of birth and language are not very definitive in terms of establishing someone’s exact ethnicity. “Lithuania” means they weren’t Irish, of course, but it doesn’t firmly establish that someone was an ethnic Lithuanian. The city of Druskininkai, for one thing, is close to the border of Poland and Belarus. After World War I, it became part of Poland for a time. How do you know “Valinski” was “Valinskis”? “His Lithuanian name was “Karolis Dionyzas Bučinskis”, according to geni.com” – How do they know that? “Lithuanian Wikipedia” – Wikis are not reliable sources. “He also grew up speaking Lithuanian and Russian” – How do you know that? I’ll include the quote, of course, but Bronson’s inclusion of Russian in his ethnicity, which is unlikely, doesn’t help solve this. I think the bottom line is that people of Lithuanian descent tend to have Lithuanian surnames, like Jason Sudeikis or John C. Reilly. It’s possible that Bronson’s family’s surnames were changed slightly from the original Lithuanian, but I haven’t seen definitive proof of that. It also mentions that at least his parents didn’t speak English, and that he himself had an accent, suggesting that his family spoke their native language/s at home. The points about the surnames is that there are a bunch of Lithuanian surnames that are similar to the slavic ones that Charles’ parents had. It is possible that they were changed for some reason. Historically, Lithuanians sometimes “polified” their surnames, due to Lithuanian being considered a peasant language. Also, most people with the surname “Butsavage” identifies as born in Lithuania (https://familysearch.org/search/record/results?count=75&query=%2Bsurname%3AButsavage~). And wouldn’t the quotes settle it? You might be right in that it is unlikely that he has Russian ancestry (even though he said it himself), but him mentioning being Lithuanian falls in line with the census and basically every other claim. He might have some other ancestry as well, but it seems certain that he was of at least part Lithuanian descent. To me, the bottom line would be that, in this case, I don’t think the assumption of Polish ancestry should take precedence over Lithuanian. There is no evidence that he had Polish ancestry besides the surnames, which still are not definitely Polish. Charles’ paternal grandparents were Frank Bunchinski/Muchinski and Elizabeth. Charles’ maternal grandparents were Thomas Valinski and Mary Annie Butsavage. It states that Charles’ father was Lithuanian, and that he “claimed Lithuanian roots”, although later it says that Charles’ father was a “Lithuanian of Russian descent”. In one paragraph it says that his mother was American-born, of Russian extraction. It also claims that Charles ones said that his ancestors were “Mongolian warriors”. Maybe it is connected to the rumor about him having Tatar ancestry. I changed it to “Lithuanian and/or Polish, possibly other Eastern European” and changed the text. Other than that, I don’t think the quotes settle it in this case. In fact, barring a detailed genealogy, it will probably never be settled (at least for me). Given the border nightmares and other things, some people seem to be very confused as to the exact ethnicity of their Eastern European ancestors. Gary Johnson, for one, said his mother’s family was Russian, which really doesn’t seem to have been the case (Americans stating they have Russian ancestry when their ancestors were ethnically Polish, Lithuanian, Rusyn, Ukrainian, ethnic German, etc. is probably the most common, but not the only, error or semi-error). I don’t doubt that his family didn’t speak English. Are you sure this record is of Bronson’s parents? It’s possible, but the ages are off by a couple of years from the census (which doesn’t rule it out). The marriage record itself says “Muchinski”, not “Buchinski”. didn’t you find anything to certify his alleged Tatar ancestry? it’s more important than the Polish/Lythuanian controversy. I agree that many people make mistakes when it comes to ancestry from Eastern Europe (Charles himself didn’t seem to know his ancestry very well, as he refered to himself simply as “Slavic” at the same time as he said he was part Lithuanian). But usually it is the other way around, with people saying they have ancestry from a larger/more well known ethnic group, when in fact their ancestry is from a smaller one (Ukrainian—>Russian, Slovak—>Czech etc.). Him saying he is of Lithuanian descent is oddly specific to be a mistake. One last point about the language: the article mentions that he had an accent when joining the military, meaning he most likely spoke a foreign language at home. If this is the case, wouldn’t he know what languages he could speak? And if he said he was Lithuanian, doesn’t that indicate he spoke Lithuanian in home, meaning he was of at least part Lithuanian descent? If he had Polish ancestry, and spoke Polish at home, he wouldn’t have mentioned Lithuanian. I’m not entirely sure about the birth record, but how many couples named Mary (Valinski) and Walter ?uchinski in Cambria, Pennsylvania, in the early 1900’s could there be? Alot of censuses have spelling mistakes, or varying spelling between censuses. As for his Tatar ancestry, I haven’t found anything reliable, apart from the claim in the book “Menacing Face Worth Millions: A Life of Charles Bronson”, where it says that Charles once stated that his ancestors were “Mongolian warriors” (Tatars tend to have Asian ancestry). If he in fact said it he might have been joking, if it was actually true it seems like he would’ve mentioned it in the other interviews as well. I don’t think it is possibly to find out if it is true or not. It seems to be a typical rumor with little evidence to back it up, like all the people in American claiming Native roots. Before the Partitions of Polish part of the Polish territory belonged also today’s areas of Lithuania. Early also Poland was occupied its territories. His time was the largest empire in europe. Followed the partition of Polish as a result of whom lost a large area. and the alliance took over the reign of Austro-Hungary, Romania and Germany, but Russia also was occupied lands lithuanian. Long time ago Lithuania was part of Poland. 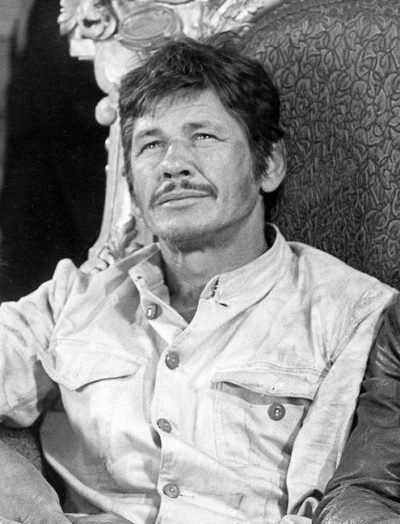 Charles Bronson is often described as being of Lithuanian or Tatar ancestry, but I’m pretty sure he was just Polish. His parents’ surnames were definitely not Lithuanian or Tatar. do you hate Lithuanians? Any source says Charles Dennis Buchinskas/Karolis Bučinskis’s father was a Lithuanian immigrant of Lipka Tatar descent, born in Druskininkai, his mom was daughter of Lithuanians parents. Are you serious with that reply? “Buchinskas”? Is there any evidence that the surname used to be spelled this way? Lipka Tatar? What is the evidence for that? (and Charles’s father was listed as “White”). His father may have been born in Druskininkai, but since it’s close to the border with what is now Poland, that doesn’t mean much. “Buchinsky” and “Valinsky” are not Lithuanian surnames. Lithuanian surnames sound like “Sudeikis”, “Belskis”, “Petronis”, and “Strelciunas”. The book is searchable online here. The word “Tatar” does not appear in it, other than as a reference to a man named “Ben Tatar” (no matches for “Lipka”). The Lithuanian website doesn’t have any details about his Lithuanian ancestry. It calls him “Charles Buchinskas”, but this is not a name that biographers cite as his birth name, and it’s not the name on the censuses. do think hes of Slavic Polish stock? You know, there are some “smaller” ethnic groups in Eastern Europe that have names that end with “sky” or “ski” (but not Lithuanians). He could have ancestry from some of those. Other than that, I would say Polish.